FRED DE SAM LAZARO, correspondent: The church has always loomed large in the life of the Philippines. Even in the ruins of typhoon swept cities like Palo, where almost every tree and every building lies damaged or flattened, the church stands tall. However, the church property did not escape the wrath of Hurricane Hayaan’s record-breaking storm surges that killed at least 6,000 people. A fresh reminder of those deaths is inside the church compound. People didn’t know what to do with the bodies of loved ones, and so in the backyard of the cathedral in Palo lies a mass grave. No one’s entirely sure of the body count beyond an estimate of several dozen. 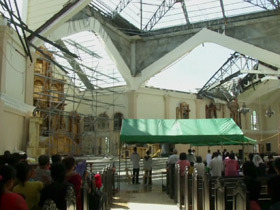 DE SAM LAZARO: Church services have continued in the cathedral, still bearing its extensive scars. Early morning on November 8, just as Mass was ending here, the storm surges intensified. Some 300 congregants stayed on for what shelter they could cling to, even as the roof blew off and some walls began to collapse. 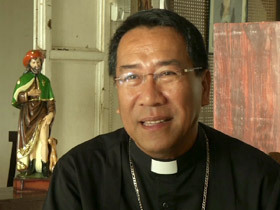 They were guided to safer sections of the building by Palo’s archbishop, John Du. ARCHBISHOP DU: After my Mass, I was still wearing sultana, the people gathered. They felt assured, they feel secure that there’s a priest, a bishop with them. I said, you go to this area. They followed me, and then they listened to me in the time when things were panicking. I said just be calm, and you pray, you pray, you pray, you pray! DE SAM LAZARO: For many people here he says, prayer has long been a central ritual in the daily routine. It was no exception in the Velasquez family that early November morning, trapped in this home as the storm hit. GIGI VELASQUEZ: We started praying the rosary, and then after we prayed the rosary it was the start of—my roof was already flying, the windows, the sliding doors. And then we went to one side of the house because we were afraid of the glasses. DE SAM LAZARO: The prayers continued as Velasquez and her daughter hung on just above the rising floodwaters. VELASQUEZ: Lord, thy will be done, it’s you, this is your will, so I started to ask for forgiveness, and suddenly our small Santo Nino came to me. This is Santo Nino. 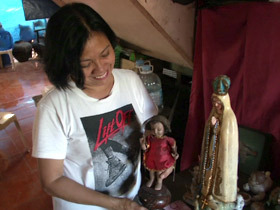 DE SAM LAZARO: The statue that floated into her grasp like this one was, in her mind, a sign of divine intervention. Santo Nino, a Filipino representation of the infant Jesus, is widely revered here for its miraculous properties. VELASQUEZ: God was present with us. He was with us even if we were in the midst of the typhoon, of the storm surge. So I believe we were guided. DE SAM LAZARO: A few miles away on the morning of the storm, Marilyn Agner was also praying hard. She and several members of the extended family that shared this home clung to the trusses that supported the roof hoping to ride out the storm surges. MARILYN AGNER: With the third wave, the trusses gave in and the current was too strong. I don’t know what happened. I floated with the current, and I know how to swim. DE SAM LAZARO: Hours later, she awoke atop a heap of garbage, discovering soon after that most of the family she was separated from did not survive. 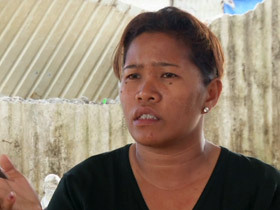 DE SAM LAZARO: Only her younger seven-year-old son, Kyle, survived. He now lives temporarily with relatives away from the storm-damaged area as Agner tries to rebuild her life and livelihood. She owns a store that sells steel roofing materials and a small bake shop. I asked her: do you still pray? AGNER: This is a big trial for me. I must pray until the trial is over. I have trust in the Lord Jesus Christ. DE SAM LAZARO: Absent any kind of grief counseling—and that is not a priority with so many more basic needs still unmet—prayer is what has brought comfort, she says. AGNER: I told Jesus Christ I can move forward with my son. I’m praying that those who are no longer here are in heaven. DE SAM LAZARO: Similarly, he says people see God manifest in the neighbors and visitors who have come to their aid. DE SAM LAZARO: One faith-based agency that’s been central in emergency relief is the international group Catholic Relief Services. It’s now moving from emergency relief to longer term rebuilding, beginning with hygiene, water, and sanitation projects. Through it all, spokeswoman Elizabeth Tromans says she’s never once heard any second thoughts about faith. ELIZABETH TROMANS (Catholic Relief Services Emergency Coordinator): Every person that I’ve talked to and listened to their story tell me how their faith got them through. The comment that I have heard is that God can send the cyclone here because the Filipino people are so strong that we can overcome even a storm this strong. DE SAM LAZARO: Unshakable faith? DE SAM LAZARO: And that faith will be the foundation of a rebuilding that will likely take years, given the limited resources available and also the ever-present threat in this flood-prone region of more natural calamities. For Religion & Ethics NewsWeekly, this is Fred de Sam Lazaro in Palo, Southern Philippines. Months after super typhoon Hayaan destroyed large parts of the Philippines, many survivors say prayer got them through the storm and the difficult times afterwards. “The comment that I have heard is that God can send the cyclone here because the Filipino people are so strong that we can overcome even a storm this strong,” says Catholic Relief Services emergency coordinator Elizabeth Tromans.